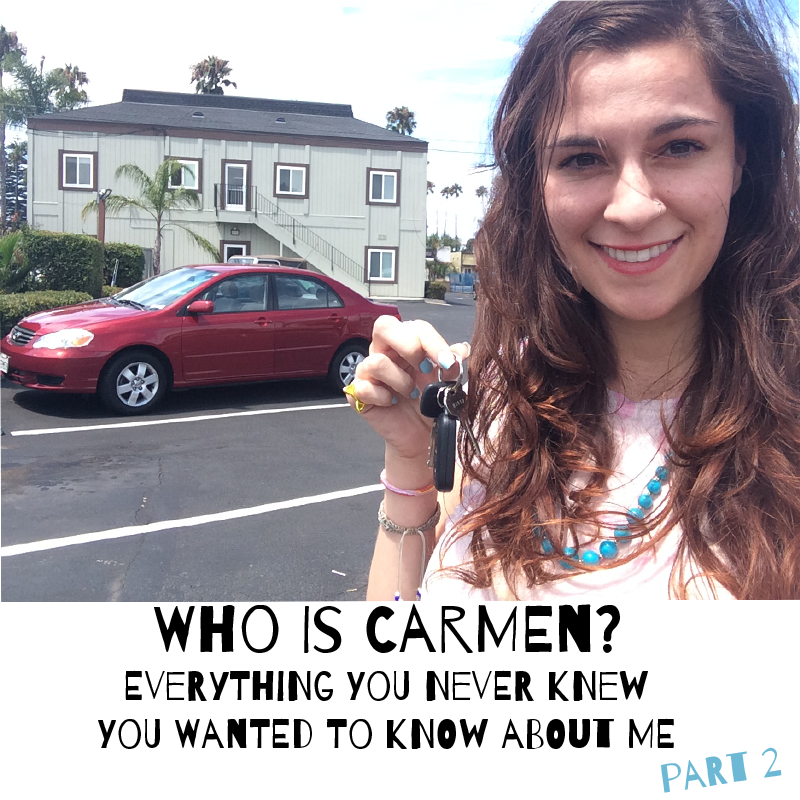 Welcome back for round two of Who is Carmen? Everything You Never Knew You Wanted to Know About Me. I like to keep my titles short n sweet, you see? ha! I got a great response with my first one, so I figured I should keep it going. As you read more & more of my posts you may get a little bits & pieces about me, my life, & my personality. That may leave you with more questions (which is the case for me when I read other people's blogs). I got my drivers license at age 22 - Appalling, right? Crazy, no? Ha yes indeed I was immobile most of my life. I had some driving anxiety when I was younger so I kept delaying the actual driving test & never took it. Once I went away to college it all went out the window. Luckily my roommate had a car so we would drive places. Even once I did get my license, I didn't have a car. Having a car & having a license are extreme blessings that I am so so grateful for. It made me appreciate the luxury of driving even more. I enjoy craft beer - I remember drinking Natural Light, Coors Light, & all those disgusting beers when I first started drinking. We bought the really cheap stuff just because we were poor college kids. Now I wouldn't touch the stuff with a 10 foot pole. If I'm going to drink it's going to be delicious. I tend to go for high-end craft beer such as Sierra Nevada or Ballast Point. I love going to local breweries & trying out the various beers they have to offer. + What type of pets did you have growing up? + What age did you get your license? + Do you drink craft beer too? 1) I had a rabbit called Betsy, a cat called Nelson, and a hamster named Nibbles. We thought Nibbles was a boy until 'he' had eight babies in the jam jar we'd popped in his cage as a toilet...! 2) I was 18 when I got my license (I'm from the UK, driving age here is 17 so I guess I was quite timely with it!). I had a little car called Giles, named after the Buffy character! 3) I do like craft beer - there are some really good places to drink it in London! I definitely prefer it to normal lagers, although it tends to be pricier! I'm 30 in April and still don't drive, shocking I know but I've always had other priorities to spend my money on, looking back now some of those really weren't a priority but at the time I thought they were. so interesting pills from you!! I love this! I had a friend that didn't get hers until that age too. At least you know how to drive now! I've always had a dog when I was growing up. Of course, I can't have pets in college. Oh well! I didn't get my licence until I was 18, but I don't have a car. And I'm 20 so I can't legally drink yet. Haha! It's always interesting learn more about you!!! 1) I had a puppy so nice! I had a hamster and that was it , I cried for a puppy but NOPE. I got my licence when I was 17 . And nope I never drink craft beer. I'm a huge fan of personal post, like you said, it's a great way to get to know the blogger. I've had a pet dog for a year and one fine day, mum told me it died. I later found out she gave it away because the dog got too much for her...wasn't the best news to me. I got my driving license at 17! LOL! Never tried any craft beers before but I am planning to! Wow ! U look so pretty ! I too have been pretty pet-less for most of my life. When I was younger and lived in a more rural area of British Columbia, I had rabbits, fish, and a dog (for only about 6 months before we gave her up because we wanted to go on vacation :( ). When I was older, my parents were against us getting another pet as we were too irresponsible to take of them in the long term. However, we have been lucky enough to take care of my brother and sis-in-law's super cute American Cocker Spaniel several times a week so I feel like I get to experience having a pet at intervals. I definitely plan on getting a dog in the near future with my fiance once we live together! As well, I adore kraft beer! It's becoming more and more popular to drink it in Vancouver so I've been to a bunch of places that offer a wide variety. Yeah, I'd love to learn more about you, so I assume others would as well! :] I have experience with other peoples' pets & kids as well but I don't think it compares to actually fully taking care of a living thing (besides a plant). Oh yes, Canada is cool because no matter the age you still have to display the letter right? Carmen, I STILL can't drive and I'm turning 26 in just over a week. So terrible, right? In my defense I've also been dealing with a little driving related anxiety and the fact that I've lived the majority of my life in Ireland meant it was never as a big a deal as it is here in the US - you can't drive until 18 and even then it's really hard to have a car in the city. And... I wish I had more excuses. LOL! 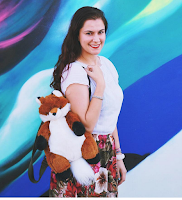 I'm loving your blog!! Haha I can definitely relate with the pet thing, seeing as we've never EVER had a pet. As for the license and the beer, I'm a little too young to know. Wait until it's legal for you -- driving & then drinking -- OBLIVIOUSLY not at the same time. Haha. 1. we always had tons of pets growing up, but I never really liked animals until I got my own dogs! 3. Love craft beer. Definitely better than the major brands! Haha I'm 22 this year and hoping to finally get my driver's (eek!). Just wasn't easy to practise driving while away at school. Great post Carmen. I got my license at 17, but I had to fail the driving test 4 times before I finally passed haha! Growing up I had a lot of dogs, because my first dog had puppies. I do like craft beer, especially wheat ales. Growing up I had fish, hermit crabs (and lots of them), and birds. My dad was allergic to animal fur and we could never get a cat or dog for that reason. When I went to college, I continued on the fish path, until one day I got a hamster. It was the cutest thing ever. Now as an adult, I have two adopted dogs. In addition to them, my husband and I always end up taking in whatever animals we find on the the street and fostering them until we find them a home. Last year we fostered a puppy and the teeniest, tiniest kitten. I got my license the day I turned 17. I literally could not wait an extra day, let alone a few hours more, to take my test. On my 17th birthday I remember taking the test at 7am or 8am in the morning, so that I could drive myself home from school that day haha I used to love driving. Now that I live in Buenos Aires, and we don't have a car in the city, I never bothered to get my license here. Also, I'm kind of too scared to drive here. People drive like lunatics.